The Niseko Free Passport Committee (NFP) has determined that Snowsports Schools (Ski and Snowboard) and Guiding businesses not directly aligned to or owned by an NFP member lift company must now become formally affiliated by the NFP in order to use the NISEKO UNITED (Annupuri, Niseko Village, Grand Hirafu, Hanazono) lift network. The aim is to ensure that the quality of ski field experience in Niseko continues to improve and that the enjoyment and safety of guests is maintained at all times. As such, the NFP has established a formal NISEKO UNITED Snowsports & Guiding School Affiliation System for third-party Snowsports Schools and/or Guiding businesses (i.e. those not owned or directly associated with NFP members) in order to become recognized as a NISEKO UNITED Affiliated Snowsports and Guiding School. Please note that it is not possible to operate a Snowsports School or Guiding businesss within the NISEKO UNITED ski resort boundary without becoming formally affiliated by the NFP. Any group, business or person which is employed by, or intends to operate, a Snowsports School or Guiding business (which includes a guided photography business) within the NISEKO UNITED ski area for financial reward. 1. Applicants must operate within the laws and regulations of Japan. 2. Applicants must operate cooperatively with NFP members and operations staff of NISEKO UNITED ski areas. 3. The ski school business must be qualified by a national certifying with International recognition. A list of the internationally recognized certifying can be found on following list. All instructors employed applicant Snowsports School, must hold a snowsports teaching certification issued by a national certifying with International recognition. Level 1 Avalanche Certification (non- recreational). Level 3 ISIA ski/snowboard instructors certification together with the ISIA avalanche and guiding module. 5. Each snowsports school and guiding school applicant must have a minimum of 5 instructors or guides. Schools with less and 5 instructors or guides which were formally affiliated with the 2017-2018 Niseko United Snowsports & Guiding Affiliation System will allowed to continue to be affiliated up to and including the 2020/2021 season. After that time, a minimum of 5 instructors or guides will be required in order to obtain affiliation. Each applicant snowsports school or guiding school must have a contact person able to communicate in business level Japanese language. Contact persons are not permitted to represent multiple applicant. 6. Eligible ski and guiding schools will undertake continuous staff training throughout the season and adopt a “continuous improvement” approach to improving the skills and development of instructors and guides working in the NISEKO UNITED area. 7. Applicants must hold a current public liability insurance policy (minimum of 100 million yen per single accident). 8. All staff members, Instructors and Guides employed by applicant Snowsports Schools and Guiding businesses must be legally entitled to work in Japan. In the case of foreign staff members, evidence of such together with an individual’s Residents Card or Gaijin Card will be required to be shown at the time of lift pass pickup. 9. When working, all staff members, Instructors and Guides employed by applicant Snowsports Schools and Guiding businesses must wear the official uniform of the applicant Snowsports Schools and Guiding business. 10. All staff members (in uniform), Instructors and Guides of applicant Snowsports Schools and Guiding businesses will be required to purchase and hold a NISEKO UNITED Commercial Lift Pass issued by NISEKO UNITED. All Snowsports Instructors and Guides purchasing a NISEKO UNITED commercial seasons pass will also be issued with a “NISEKO UNITED Affiliated” badge (one per commercial seasons pass). This badge must be affixed to the Guide’s/Instructor’s uniform jacket and must be clearly visible at all times when working. The badges will be issued free of charge. However, the badge and commercial lift ticket together will be subject to a 1,000 yen deposit. The badge and commercial lift pass must be returned together to the place of purchase in order to receive a refund of the deposit paid. Validity of each badge will expire at the end of the ski season designated on the badge. 11. When an Instructor or Guide is working, a NISEKO UNITED commercial seasons pass will not be valid unless it is used with a “NISEKO UNITED Affiliated” badge affixed to his/her jacket. ① 250,000 yen (including consumption tax) for instructors and guides who are not members of the Niseko Winter Guiding Association (NWGA). ② 115,600 yen (including consumption tax) for instructors and guides who are members of the Niseko Winter Guiding Association(NWGA) and also for guided photography business operators. Those who wish to perform snowsports lessons within Niseko United ski area must purchase the ① NISEKO UNITED Commercial Season Pass. 2) NISEKO UNITED commercial season passes will be issued to individuals with the individuals’name and photograph embedded in the pass. NISEKO UNITED commercial season passes are not transferable. 1. The five-day commercial pass is valid for the entire 2018 – 2019 season and can be used on non-consecutive days. 2. The pass will be fully transferable. The pass does not require a person’s name or photo for issuance, but will display the name of the applicant Snowsports School or Guiding business. 3. An eligible Snowsports School or Guiding business can purchase any number of five-day commercial passes, but only up to a maximum of the same number of commercial seasons passes that the Snowsports School or Guiding business has purchased. For example, if an eligible Snowsports School or Guiding business purchases five commercial seasons passes, then that Snowsports School can purchase up to five x five-day commercial passes. 4. Instructors or Guides utilizing the five-day commercial pass will not be required to have a “NISEKO UNITED Affiliated” badge affixed to their jacket. 5. A five-day commercial pass may be renewed after expiry, subject to the maximum purchase limits as defined in point 3 above. Applicant Snowsports Schools and Guiding businesses will be required to submit a NISEKO UNITED Snowsports & Guiding School Affiliation System application in the required format not later than one week prior to the intended commencement of the applicant’s Snowsports School or Guiding business. The applicant must submit their application to the NISEKO UNITED NFP member where they will most frequently start or operate from. ∗Note: Hanazono and Niseko village ski areas will not allow a lesson commencement point to be established or advertised at the Hanazono or Niseko Village ski areas under any circumstances. 1. A correctly filled out NISEKO UNITED Snowsports & Guiding School Affiliation System application form. 2. Group or Company profile – including a detailed description and location of the intended business, full contact details (summer and winter) and contact details of Japanese speaking staff members. 3. A copy of the applicant’s Emergency Management Plan – as required in the case of guest or staff member injury or serious incident. 4. A copy of the applicant’s Staff Training and Development Plan. 5. A photo of the applicant’s Snowsports School or Guiding business uniform. 6. The number of instructors/guides to be employed. 7. Full details and qualifications of the representative qualified person(s). 8. Full list of staff members and instructors who will purchase a NISEKO UNITED Commercial Lift Pass. Please note that, in the case of foreign staff members, evidence of eligibility to work in Japan (e.g. copy of work visa) together with their gaijin card must be shown at the time of lift pass pickup. 9. Evidence of public liability insurance (minimum of 100 million yen per single accident) must be provided. Normally, this will be in the form of a “certificate of currency” as provided by the applicant’s insurance company. The NFP member which originally received the applicant’s application must be immediately advised of any changes/updates to an applicant’s business and staff levels. Please note that affiliation of applicants will be at the sole discretion of NFP members. Once affiliated, applicants will then be able to purchase NISEKO UNITED Commercial Lift Passes for all staff members (in uniform) and instructors and guides as shown in the applicant’s application. Individuals, groups or businesses will not be permitted to conduct any form of Snowsports School or Guiding business for reward within the Niseko United ski areas without first obtaining the necessary NFP affiliation approval as outlined above. Tout for business and/or engage in any form of publicity within a NISEKO UNITED ski area. A business or individual must not advertise (brochures, website etc.) that lessons or guiding services will be available at any NFP member ski area without first obtaining permission from that ski area. This includes the generic term “NISEKO UNITED” ski area. Conduct lessons or guiding services without wearing the designated Snowsports School or Guiding business uniform as advised to the NFP in the applicant’s application. Under no circumstances will any individual or business be permitted to use any form of lift pass other than a NISEKO UNITED Commercial Lift Pass for the conduct of snow sports lessons or guiding services within the NISEKO UNITED ski areas for financial reward. This will be legally effected under the Cableway Business Transportation Agreement, which applies to all purchasers of lift passes within the NISEKO UNITED ski areas. School teachers instructing his/her school students on a short term or temporary basis as a lesson. Snowsports Schools already affiliated by the NFP. a) The type of lift ticket in use. b) The name and embedded color photograph of the user. c) The lift ticket number. The hand-scanner will be able to store this data for downloading and future reference. If the Observer believes that an incorrect lift ticket is being used, the affected person will be handed a copy of a “Consultation Request” document, together with reference to the NISEKO UNITED Snowsports & Guiding School Affiliation System. There shall be no further in-situ engagement or confrontation with that person. It is then incumbent on that person to arrange a meeting with an NFP member within 48 hours of detection to prove that the correct lift pass is in use. If that person does not arrange a meeting within 48 hours, then their lift pass will be automatically cancelled. (1) If the NFP member is satisfied the person is not teaching or guiding for financial reward, then nothing occurs. That person will be invited to apply through the NISEKO UNITED Snowsports & Guiding School Affiliation System to become a NISEKO UNITED Affiliated Snowsports & Guiding School. Once approved, the cost of that person’s lift ticket may be used as a partial credit towards the purchase of a NISEKO UNITED Commercial Lift Pass. If the person cannot (or chooses not to) meet the requirements to become a NISEKO UNITED Affiliated Snowsports & Guiding School, then that person will be warned not to teach or guide further (first warning). That person will be required to sign a “Personal Declaration” document that they are not participating in the business of a Snowsports & Guiding School and that, if they are informed upon again and an NFP member is satisfied that the person is teaching or guiding for financial reward, their existing lift ticket will immediately be cancelled with no refund. 1. An NFP member will send an email (or telephone message) to the identified person again and will request a private meeting to discuss whether or not that person is involved in, or conducting, a Snowsports School business. That person will have 3 days to respond to that meeting request, or their lift pass will be automatically cancelled with no refund. (1) If the NFP is satisfied the person is not teaching or guiding for financial reward, then nothing occurs. (2) If NFP member believes that the person is teaching or guiding for financial reward, then that person’s lift pass will be cancelled immediately with no refund. Affiliated Snowsports Schools and Guiding businesses should note that if any of their staff members are caught without the correct lift pass and/or badge, the NFP reserves the right to cancel all lift passes issued to that Snowsports School or Guiding business, without refund. Affiliated Snowsports Schools and Guiding businesses are encouraged to identify persons they believe are operating illegally to the NFP Lift Pass Observers. The Lift Pass Observers will then gather data on those individuals lift passes and report the lift pass details to NFP members. 1. If NFP members are satisfied that a person is teaching or guiding for financial reward, or behaving in any way contrary to the definition and/or spirit of the NISEKO UNITED Snowsports & Guiding School Affiliation System, then the NFP reserves the right to cancel or suspend that person’s lift pass immediately with no refund. 2. If a person’s lift pass has been cancelled by the NFP, then that person will not be able to purchase a normal season’s pass for the following one season. That person will however be able to purchase a commercial season’s pass for the following one season, subject to the NISEKO UNITED Snowsports & Guiding School Affiliation System requirements. 3. The NFP reserves the right to modify or alter the NISEKO UNITED Snowsports & Guiding School Affiliation System at any time. 4. 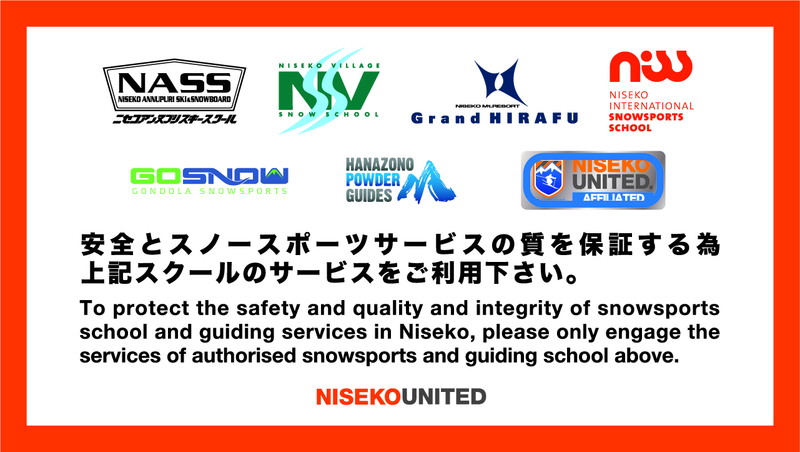 Snowsports Schools and Guiding businesses affiliated under this process will not be entitled to any form of lift priority at any NISEKO UNITED ski area. 5. NFP members may erect signage across the NISEKO UNITED resort area informing residents and guests of the benefits of the NISEKO UNITED Snowsports & Guiding School Affiliation System and the advantages of engaging only properly affiliated instructors and guides.